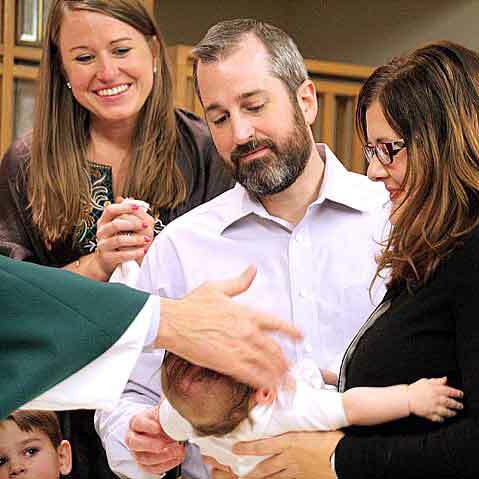 Your baby’s baptism is a time for celebration and joy. It is the first and most important step you will take as Catholic parents in the life of faith of your child. Baptism is the first Sacrament of the Catholic church and initiates us into the Body of Christ – into His life, Death and Resurrection. It is the essential sacrament in becoming a disciple of Christ and indelibly marks us as His. This sacrament is the essential prerequisite for all the others. Baptism is God’s way of showing love for each child. It is the sign that reminds us that we are loved and created in God’s own image. Through the waters of faith, your child is welcomed into God’s family. To arrange and prepare for your child’s Baptism at Immaculate Conception and St. Joseph Parishes, please submit our Baptismal Intake Form. A member of our staff will then contact you to begin the process.